Huntington Beach, Calif. - It was a nice Veteran's Day afternoon in Huntington Beach today. A touch on the warm and dry side with Santa Ana conditions but we had a great meet with 83 bikes. Recently we lost a legend in Indian Motorcycles and Orange County. Bob Nichols was well known and respected for his racing parts and Indian Motorcycles. Bob started racing motorcycles in the early 1940's but due to his height, he didn't have a successful racing career. After serving our country in WWII, bob had a rich career including heading up the machine shop for the Douglas Aircraft Company. Bob Nichols Racing was his own manufacturing company where he designed and built high performance racing engine parts for motorcycles, primarily for the Indian brand. Bob taught himself CAD Computer Aided Design and was designing parts well into his 90's. He personally owned and raced two Big Base Scouts which both have won Bike of the Month on separate meets. The first being October 2014, and the second being October 2017. Both of these bikes are still being raced today. He was a good friend of mine for the past 10 years and attended our meet every month until recently. He will be greatly missed. Bob Nichols Celebration of Life will be held at noon on Sunday, November 18 that the Mile Square Park Banquet Center 10401 Warner, Fountain Valley (inside golf course). Because Bob was so well known and liked his family needs to get a rough headcount so they may accommodate all those wishing to attend. Thank you all for your condolences. The Bike of the Month contest was extremely close this month, the top three places only differed by one vote each. 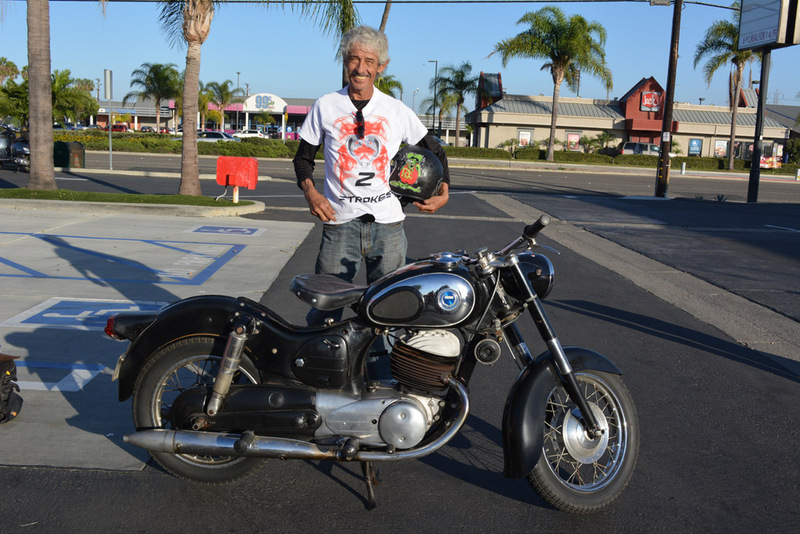 Congratulations to Ernesto Quiroga of Long Beach for winning Bike of the Month with his 1988 Laverda SFC 1000. Ernesto won the Bike of the Month trophy provided by Russ Brown Motorcycle Attorneys. www.RussBrown.com. Ernsto has owned this very rare low mileage 100% original bike for two months. 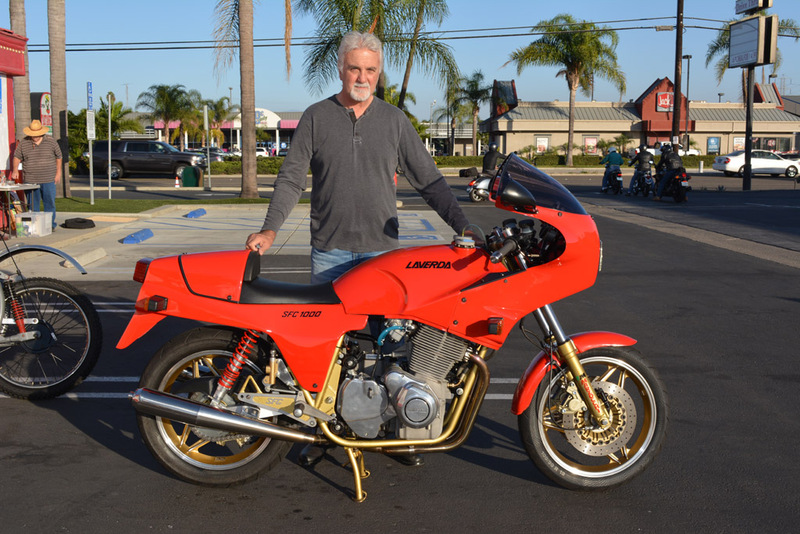 Read all about the 1988 Laverda SFC 1000 on our Bike of the Month page. Javiar Castellanes of Anaheim came in Second with his 1965 Sears Allstate 250. Javiar has only owned the bike for two months, but he bought it from club member Greg Slator who had the bike for five years. The Austrian company Puch manufactured these bikes for Sears and Robuck Company. The Puch 250 SGS was known as the "Twingle" due to it's Split Twin Two stroke engine where the two cylinders share the same combustion chamber. It is a fairly rare motorcycle in the United States. Javiar won a EuroPapi t-shirt provided by Roland Ortiz of EuroPapi Motorcycle Streetwear, www.europapiusa.com. 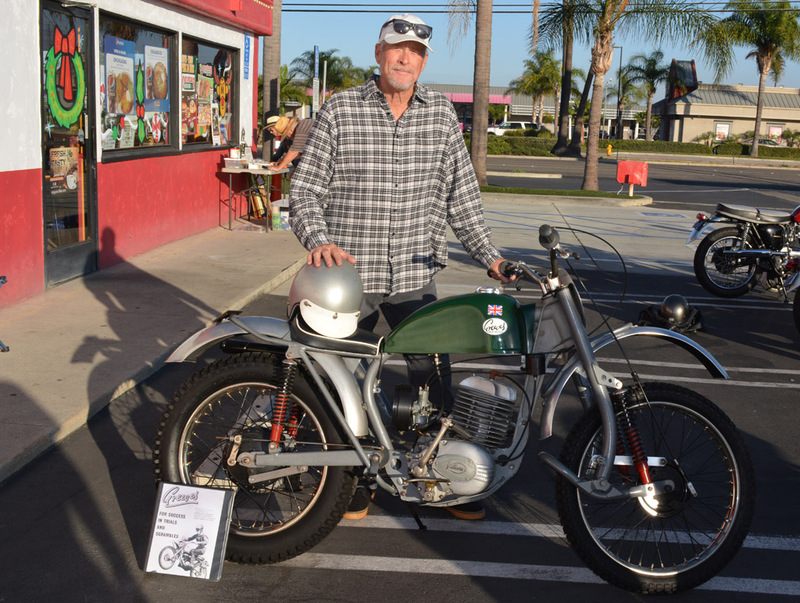 Scott Daniels of Tustin took Third place with his 1965 Greeves Anglian. Scott has owned the Villiers powered 250cc single for two years and restored it himself. Thanks to everyone for showing up and making this another great event and a special thanks to the team, Tom & Debbie Hopkins. I'll see you next month on December 9, 2018.